"Two ingredients...amazing scones! 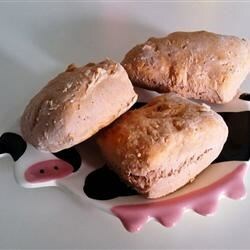 Play around with the flavor of ice cream to make different types of scone." Pour the ice cream into a large bowl; fold the flour into the ice cream until the dough just begins to come together. Using your hands, gently knead the dough into a ball, adding flour as necessary to keep the dough from sticking. Turn the dough out onto a lightly floured surface and roll into a 9x13 inch rectangle. Cut the dough into 12 circles, 3 inches in diameter, and place on a baking sheet. Bake in the preheated oven until golden brown and cooked through, 15 to 20 minutes. Shockingly bad results! The dough was VERY difficult to work with. They smelled delightful while they were cooking. The end result- did not taste AT ALL! Really, no flavor whatsoever.